A sewer gate valve can completely prevent a city sewer from backing up into your property. There are different types of sewer valves, and a gate type valve is quite different than a check valve. While a check valve (also called a backwater valve) works automatically by the pressure of water forcing a flap to close, a typical gate valve must be closed manually. 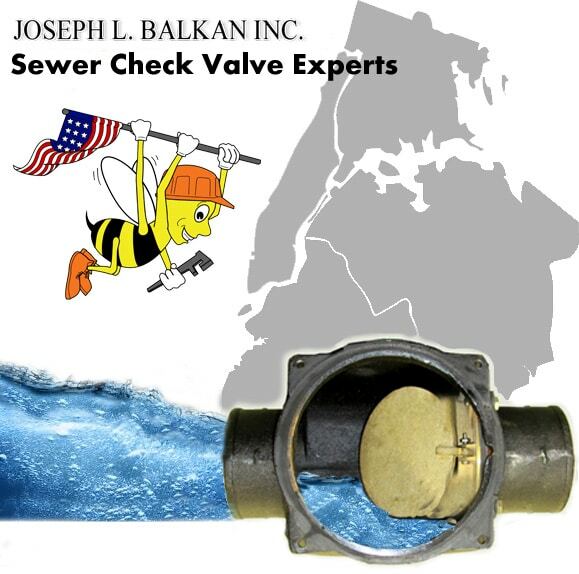 Another important difference is that most check valves do not completely stop water flow, they greatly reduce the backflow of water. By greatly reducing the amount of sewer water backing up enough relief is provided until the public drain system is properly flowing again. The big advantage of a gate type valve is that once closed it completely stops the backflow of waste water from a public sewer. It is ideally suited for one or two family houses that do not have a large amount of waste water flow, unlike multi-family or large commercial buildings. This is important because once the valve is closed waste water cannot flow out of the property to the public drain system. On larger properties a sewer backup would occur due to the greater amount of water they use in the building. Another instance when this type of device is ideal is when the city sewer regularly backs up after heavy rainfall or during high tide tables. If the city system backs up at predictable times then the property owner has ample time to close the gate ahead of time. After the public drain system is flowing properly again, the valve can then be re-opened. A gate type valve is easily operated, easy to maintain, and provides 100% control of backflow from a public drain system. A typical sewer valve installation is started and completed within the same work day. In most cases the existing house trap and access pit have to be removed in order to perform the installation. That is why a new house trap and sewer access pit with a fitted cover is typically part of also installing a sewer valve. A new trap with tight fitting covers will also help ensure that waste water or sewer gases never escape into your house. A new access pit with a tight fitting cover helps greatly in reducing a way for water to get into your basement. An anti-slip tight fitting cover reduces the chance of any trip hazards from an open sewer pit, or a pit with an ill fitting cover. The first thing to do when you suspect the public drain system has backed up into your property is to call 311. The NYC 311 system is set up expressly for situations like this. It is important to be very clear when calling that the problem is waste water, not fresh water or drinking water. These two very different issues are handled by completely different crews from the NYC DEP. It is also important to receive a complaint number and store that number in a safe place. The complaint number will be helpful in being able to obtain updates on your complaint. If you wish you can also contact the 311 system online, which frequently takes less time and you would also receive a valid complaint number. One thing you should never do if you suspect the city sewer is not functioning is to open your house trap. If you open the trap you risk the waste water from the public drain emptying into your basement. Waste water can cause damage to personal property and to the property itself. Damage can be done to rugs, sheet rock, and floors – just to name a few. After contaminated sewer water enters your property it is important to disinfect, wash, and dry any affected areas or articles. Acting quickly can avoid mold and additional health concerns. A very important thing to keep in mind is avoiding any personal contact with any contaminated items or areas. It is important to wear rubber gloves and cover other areas of your person carefully. If the damage from the backup is extensive you may choose to hire a professional cleaning service and contact your insurance broker. Using the proper type detergent, wash and carefully dry all items suitable for a washing machine and dryer. Disinfect and clean any surfaces such as floors and furniture using products meant for this purpose. Drying all affected areas quickly and also using a dehumidifier to remove any moisture are a good idea. The cost of installing a backwater valve or a gate valve on your home drain system is frequently less than the damage caused by one public sewer backup. When you add in the health concerns and aggravation caused by a backup, a sewer valve may be a wise choice in solving your house drain issues.